It would be tempting to conclude from the benign nature of a positive housing market that surveyors and valuers have little to fear from lenders in the near future. The confetti letters of litigation are for many like a distant nightmare, readily and willingly forgotten in the context of a bullish housing market in the last few years. But risk is always present and the recent disclosure that foreign investors were inserting Brexit clauses into property deals done in advance of June 23, is a timely reminder that property valuers are not a one-way bet and are as susceptible to economic shocks of one sort or another as any other asset class. For that reason, among others, surveying firms and lenders are keener than ever to establish defensible valuations, injecting better quality data into the process and in a more timely manner. 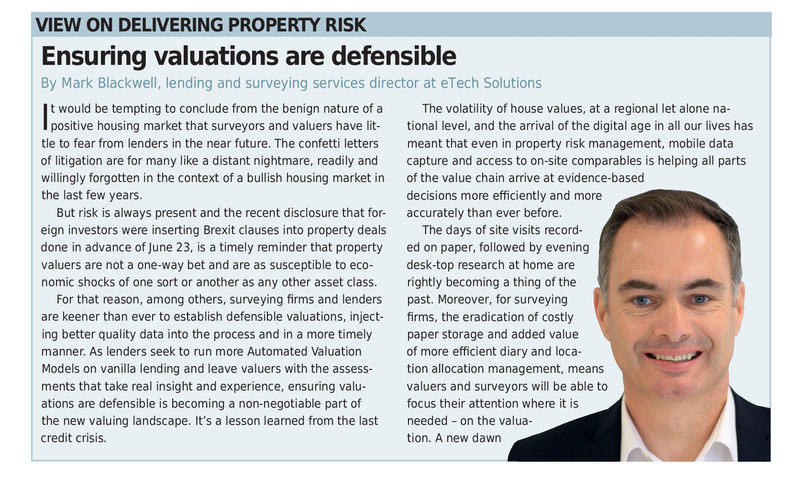 As lenders seek to run more Automated Valuation Models on vanilla lending and leave valuers with the assessments that take real insight and experience, ensuring valuations are defensible is becoming a non-negotiable part of the new valuing landscape. It’s a lesson learned from the last credit crisis. The volatility of house values, at a regional let alone national level, and the arrival of the digital age in all our lives has meant that even in property risk management, mobile data capture and access to on-site comparables is helping all parts of the value chain arrive at evidence-based decisions more efficiently and more accurately than ever before.